Hogar Controls launched its Pro Solutions lineup of control and automation products for the commercial markets at ISE 2018; the line is designed to provide easy customization, flexibility, and style for building managers. The Hogar Controls Touch Panel series challenges every perception of what a smart lighting device looks like in the home, hotel room, or commercial environment. The Touch Panel series allows users to set customized smart lighting and control actions through programmable buttons that can be as simple as dimming the lights to 50 percent, or as complex as controlling multiple devices through smart scenes. The Touch Panels offer support for Z-Wave or Zigbee to ensure wireless compatibility across a wide range in cooperation with the project design. With features like multi-touch control of devices through pre-programmed touch, tap, or finger swipe, a variety of configurations including built-in sockets (select models), and access via the Hogar Controls mobile app, the Touch Panel series offers integrators easy in-room control. Available in various styles, colors, and control button options like–One Touch Panel, One Touch Dimmer Panel, Two Touch Panel, Three Touch Panel, Four Touch Panel, Eight Touch Panel, and Ten Touch Panel-the panels offer a variety of options to best fit a property’s size and individual system requirements. The 3-in-1 multi-module is a tiny controller that enables users to turn any existing switch or socket into a Z-Wave smart switch. At just over a half inch (12 mm), the module can be easily installed into most enclosures, flush-mounted junction boxes, behind lights, and in wall sockets to control and dim lighting, blinds, shades, and activate scenes. The 3-in-1 module can be installed within a few minutes and offers the ability to change functionality with a simple program button. One of the biggest challenges when building end-user customer relationships is working to provide education on the benefits of connected living. Particularly for a whole building automation system, showcasing the power of a suite of devices working together is challenging in any showroom. Making it easy for dealers with or without a showroom, Hogar Controls created a unique Interactive Demo Toolkit. 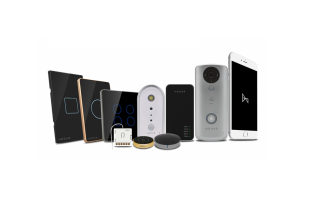 The toolkit is an out-of-the box building automation and control system, with built-in devices to show off the power of devices like voice control, motion sensors, climate control, and more. With a built-in screen, the toolkit is a “home in a suitcase” model that is easy to transport and gives the dealers a mobile sales tool. The Hogar Dealer Toolkit is available to qualified dealers.